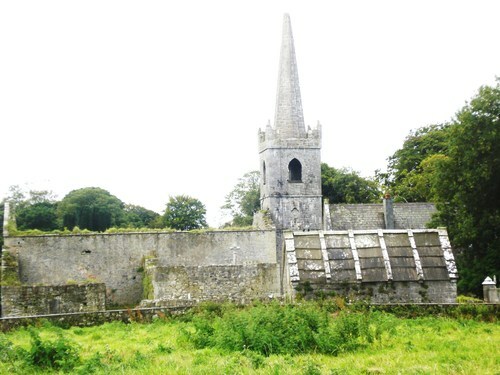 Kilkeedy graveyard is located beside the old Kilkeedy Church of Ireland church. It is said that in Kilkeedy graveyard the coffins are laid on the raised footpath outside the wall of the graveyard and prayers are said there before proceeding to enter the graveyard. Here are two different explanations offered for this practice. One was that Roman Catholics said prayers outside the Protestant graveyard and the second reason was that the Roman Catholics had to get on their knees to ask the landlord for the right to be buried in Kilkeedy. There are tombs to the Cooper family of Cooperhill, Lord Emly and the Massey family within this graveyard, and there is a third unnamed tomb to the left of the church that has AD 1865 written on it. We have been informed that the third tomb we refer to is the Massy (Lord Clarina) vault. A new section has been added to the graveyard. In the older section of the graveyard, there are a lot of simple stone markers as headstones. The oldest headstone that we found was to Laurence Madden, who died August 21st 1748, aged 48.